It’s easy to think that the Summer X Games is still a relatively new fixture on the annual sporting calendar, but we’re now approaching the 19th year of summer X Games madness! We couldn’t quite say that it started from humble beginnings, but there’s no doubt that both the size of the games and the interest in the games itself, has grown year upon year. Whether you’re a fan of motocross, skateboarding, BMX riding or rally cross, there’s something for everyone in the X Games, and this year looks to be the best yet. But why not take a stroll down memory lane? 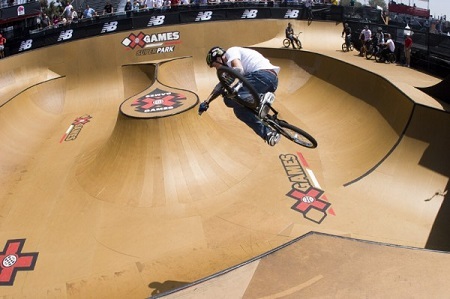 Let’s look back at the history of the Summer X Games to see just how far things have come. Back in 95, The Summer X Games was in its inaugural year. That’s not to say that it wasn’t a big deal. ESPN launched the Games on the back of huge interest in extreme sports, and it didn’t disappoint. This was the first time the general public really got the chance to watch extreme sporting action on their TV’s in a competitive environment. With a nation tired of the same old sporting events, it achieved great interest, with many overnight stars being born. Matt Hoffman won on his BMX on the vert, and landed himself a lucrative Console tie in, and we saw some exciting stuff in street luge. Of course, back in ’95, Tony Hawk was still in his pomp, and took gold in the skateboard vert competition. We’ve already touched on a couple of people who have become household names through their involvement in the Summer X Games, but let’s take a moment to remember The Birdman, Tony Hawk. This guy was such a pivotal figure in Summer X Games history, and remarkably won both singles vert gold and several doubles vert gold medals. 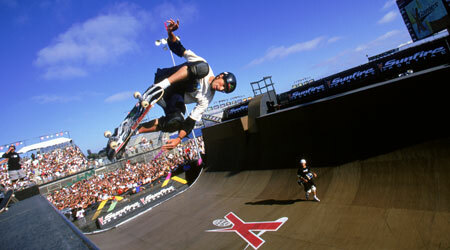 Despite retiring from the sport in 1999, Tony Hawk is still considered to be an iconic image in terms of the games. Skateboarding may be the most talked about sport in Summer X Games, but we have to give a mention to the incredible Dave Mirra, who won gold five years in a row on Street/Stunt Park, and completed three gold performances on the very ramp. An incredible haul over a span of five or six years, which puts him up there as one of the very biggest stars of Summer X Games. There’s no doubt that we can expect the Summer X Games to continue to go from strength to strength. There’s without doubt a growing audience for extreme sports, and more knowledge from fans on all areas of the games. Interest now comes from the world over, and many millions of people will be tuning in. It’s a different animal from the one that was born nearly twenty years ago, but it still manages to hang on to an alternative vibe in comparison to other more standard games such as the Olympics. It’s still about the thrill of people doing something challenging that they love, and for this reason, the Summer X Games will always be a fantastic spectacle. This entry was posted in BMX, Featured, Land Sports, Motocross, News, Skateboarding and tagged Summer X Games, X Games. Bookmark the permalink.